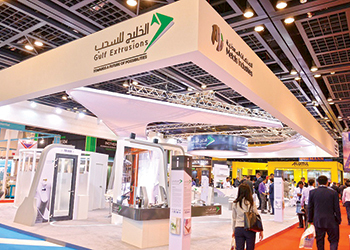 Gulf Extrusion’s stand at The Big 5 2015. Safaa, as the powder coating is called, was launched at The Big 5 show which was held last November in Dubai, UAE. Gulf Extrusions is a member of the UAE-based Metal Industries-Al Ghurair Group. Meanwhile, Gulfex’s new software is for the optimisation of the estimated time of completion and structural calculation. “The new solution will help in reducing production and estimation time by 50 per cent as well as preparing structural and u-value calculations,” says Al Mekdad. Also showcased were solutions that meet and even exceed performance criteria for fire safety and acoustics in building envelopes. Al Mekdad says The Big 5 is one of the Middle East’s biggest and most established exhibitions for building and construction and a perfect platform for new launches. Gulfex also conducted a Continuing Professional Development (CPD)-certified workshop on ‘Fire Safety in Facades’, in addition to organising a live demonstration of the best practices in façade installation covering accessory and fire-fighting equipment, during its participation at the construction show.